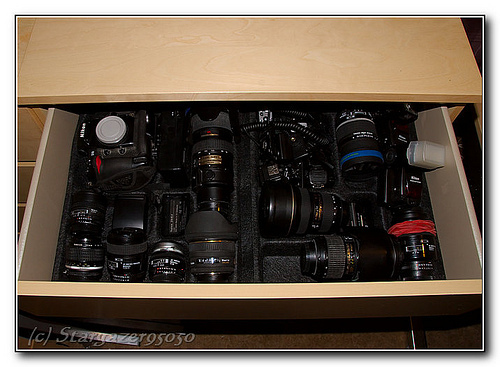 Flickr user Stargazer95050 found a neat way to organize his photo gear in a drawer. Using the grooves bumps and slits of a cutlery tray the lenses, bodies, strobes and other accessories lay safely in place. “Initially, I stored most of my stuff inside the photo bag. Ready to go anytime !! As the volume of my gear grew, I shuffled things around, storing some of the stuff on my shelves. Over the time, this got really messy and so NOW I ripped up most of the shelves and cabinets in my office & living room and totally reorganized things (adding more cabinets). Still not yet done — but it really is taking shape now !! And I want to add an AC extension cord into the drawers, so I finally can store & recharge the batteries in-place. Andy also suggest using a IKEA DIODER to add LED light to the drawer without the need for additional wiring.